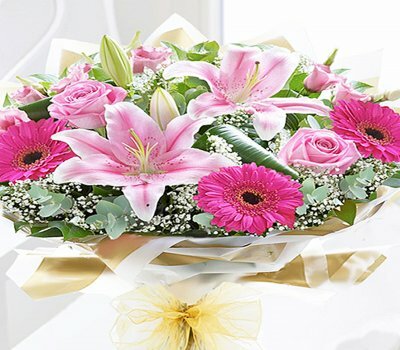 As one of our most popular gifts, this beautiful selection includes a fragrant Oriental lily classic pink roses and with pretty hot pink germinis and a sprinkling of gypsophila. 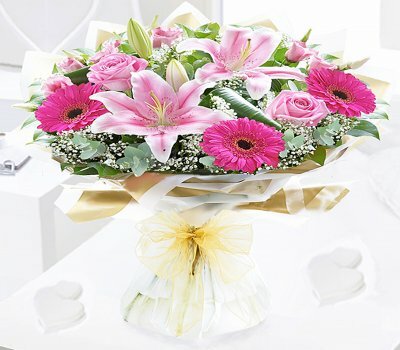 the pink Oriental lily and large headed roses takes centre stage and is beautifully complemented with the mix of favourite flowers, This chic and contemporary hand-tied bouquet is rich with texture and detail and also the lily adds a beautiful sweet scent. 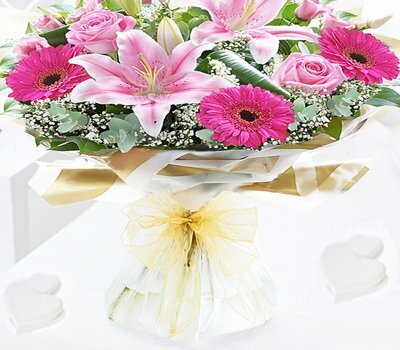 Presented in cellophane and finished trimmed with a complementary gold voile ribbon bow, this hand-tied bouquet will be and hand-delivered in a stylish gift box to create a stunning gift for any special occasion. 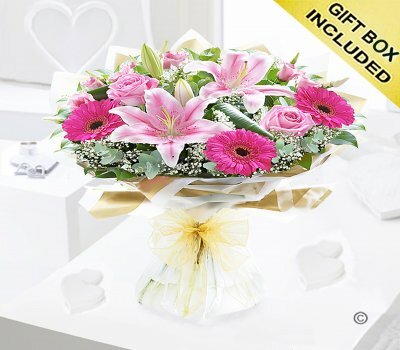 Featuring: pink Oriental lily, pink large-headed roses, hot pink cerise germinis and pink lisianthus, hand-tied with gypsophila, aspidistra leaves, eucalyptus, salal and beautifully gift wrapped, trimmed with a gold voile ribbon bow presented in a stylish gift box, finished with flower food, card and envelope with your personal message in.